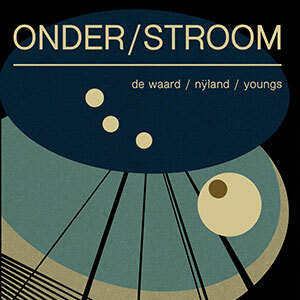 Onder/Stroom is the first collaboration between Frans de Waard, Peter Johan Nÿland and Richard Youngs. ‘Zonder Stroom’, meaning ‘sans electricity’, was a short-lived program curated by Extrapool with performances that were completely without electricity (no amplification, no lights, no fridge) and one bleak and damp winter’s afternoon we drank coffee and decided to use all the electricity there was, recording any keyboards, synthesizers and electronics they could lay their hands on. Then they tried to make sense of that day. This album features mixes and remixes of one joyful and intensely creative session. Richard Youngs has been involved with music for most of his life. He discovered the power of the art form by thumping the family piano as an angry 5 year old. In the intervening 45+ years he has attempted to harness the same experimental, naive, playful power in his recordings and live performances. He has performed floor spots at Hertfordshire folk clubs, and worked with members of the Royal Conservatoire of Scotland. He has recorded a modern pop album (‘Beyond the Valley of Ultrahits’), and a score for the BBC SSO (‘Past Fragments of Distant Confrontation’). He was commissioned to write music for the art film ‘The Poor Stockinger, the Luddite Cropper and the Deluded Followers of Joanna Southcott’, and his music has appeared in the 2013 feature film ‘Drinking Buddies’. He is the drum machinist of the Flexibles, singer of AMOR. He is classically trained in piano and guitar, but musically he grew up in the shadow cast by punk rock. Adopting guerrilla recording techniques, the independent D.I.Y. ethic is at his core. describes as ‘silly disco music’. He has played concerts in Europe, USA, Canada, Russia and Japan, and collaborated with Steven Wilson, Jaap Blonk, Andrew Liles, Radboud Mens, Keiji Haino, Pan Sonic and others. Peter Johan Nÿland is best known for his work with intensive synth duo Distel, avant-garde leviathan Hadewych and melancholic ambient project Norn. Other ventures include collaborations with the likes of Dead Neanderthals and Trepaneringsritualen. Next to these involvements he does the odd audio engineering job and until recently worked as a composer for television documentaries and other media. Early exposure to synthesiser experimentation, combined with the plethora of percussion sounds found in metal school fences and hypnotising phase-shifting pencil-tapping on desks removed his ability to just take sounds for granted. Keep your kids away from said objects, lest they turn out the same.